Considering the average annual biomass of discards estimations and the consumption rate found in this work, 106.1–117.9 t may be offered as a food subsidy to scavenging seabirds in the study area and should support a substantial part of local populations. Our results constitute baseline information on the annual amount of fishery discards and their exploitation rate by seabirds in the Ionian Sea, and suggest further work for a complete understanding of the potential impacts of the discards reform bill on seabirds. The fishing industry and seabirds are generally characterised as competitors for marine food resources. To be more specific, interactions between fishing and marine birds may have both negative consequences, such as the reduction of prey for the latter due to overfishing, and positive ones, e.g., via the global annual supply of 7.3 × 106 t discarded unsaleable bycatch (Kelleher 2005) as food for marine avifauna populations (Montevecchi 2002; Louzao et al. 2011; Tremblay et al. 2014). Consequently, fisheries have considerable influence, at several scales, on the distribution of seabirds at sea due to the availability of discards (Furness 2000) but they also have an indirect impact on the ecology and population dynamics of seabirds, which are linked to prey abundance at both local and regional levels (Fauchald 2009). The European Commission (EC) has already adopted an Action Plan to enhance fisheries sustainability in the Mediterranean by implementing specific management measures. More specifically, the EC is currently proposing the banning of discards by imposing an obligation to land the unwanted catch as a key point of the proposed reform of the Common Fisheries Policy (EU 2013). Quantification of fishery waste has been identified as crucial for upgrading stock assessments and exploring potential impacts of the fishing industry on marine ecosystems (Rochet and Trenkel 2005). According to the Food and Agriculture Organization (FAO) of the United Nations (2016), the total annual biomass of fishery discards in the Mediterranean Sea is of the order of 230,000 t, corresponding to 18% of total catches. Bottom trawls are reported to be responsible for the bulk of discards (> 40%); discard rates for pelagic fisheries, such as pelagic trawls and purse seiners, are generally lower ranging between 10–50 and 2–15% respectively, while relevant information on discards for small-scale fisheries is relatively scarce; nevertheless, available data estimate the discard ratio at less than 10% for trammel and gillnets (FAO 2016). Discards constitute a food source for several groups of species (e.g., seabirds and benthic scavengers) and cause alteration of trophic interactions, which affect ecosystem function and structure. For example, Bicknell et al. (2013) have shown that a decline of discards could influence different aspects of seabird biology including foraging behaviour, breeding success, body condition, and survival rates for different age classes. Nevertheless, the impact of the forthcoming ban on discarding within the marine environment is largely unknown even if relevant studies have been conducted recently (Bellido et al. 2011; Louzao et al. 2011; Oro et al. 2013; Depestele et al. 2016). Moreover, the ecological effects on the marine environment may be of considerable importance for ecosystems in the extremely oligotrophic eastern Mediterranean, which is characterised by a significant knowledge gap regarding the interactions between fisheries and seabirds, e.g., discard consumption by scavenging seabirds. These features and the consequences of eliminating the energy input of fishery discards into the ecosystem may have been undervalued and should be examined within the framework of an Ecosystem Approach that, in Europe, is implemented through the Marine Strategy Framework Directive. Fishery operations in the Ionian Sea (western Greece, eastern Mediterranean) have a severe impact on marine birds, either negative via bycatch incidental mortality caused by various fishery gear such as bottom longline, surface longline, and gillnet (Karris et al. 2013) or positive, since trawlers provide a significant amount of discards that constitute an important food resource in this oligotrophic marine ecosystem, as highlighted in a previous study (Machias et al. 2001). Trawl discards in the Ionian Sea are estimated at approximately 38% of the total catch (Tsagarakis et al. 2008), representing the bulk of Greek fisheries discards. The current study investigates the occurrence of different scavenging seabird species around fishing trawlers as well as the exploitation of discards produced by bottom trawlers in the eastern Ionian Sea. Establishing baseline information on the annual amount of fishery discards and their exploitation rate by seabirds in the Ionian Sea will contribute to predicting the consequences on these scavenging top marine predators in case of a ban on discarding at sea. 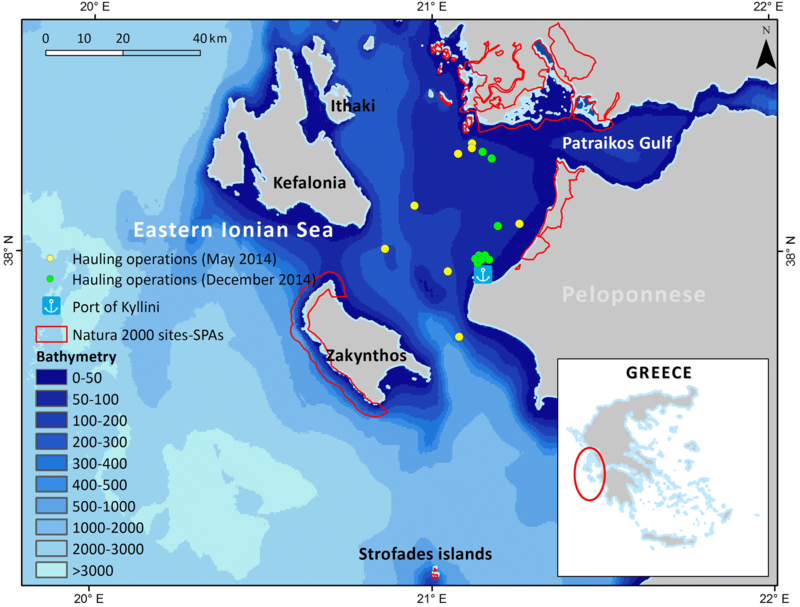 The study was carried out in the eastern Ionian Sea (37°50ʹ–38°20ʹΝ, 20°50ʹ–21°20ʹΕ) (Fig. 1). This marine area is known to host a significant network of breeding and foraging sites for seabirds such as Strofades Islands (Fric et al. 2012; Issaris et al. 2012; Karris et al. 2017), while intensive fishing is one of the main human activities in the area (see for example Karris et al. 2013). More than 35 small and large fishing ports are distributed along the coastline extending west towards the coasts of the islands of Zakynthos and Kefalonia and east towards the coasts of the Peloponnese and Sterea Ellada. Nearly 700 fishing vessels are registered in the area and the majority are small boats that use trammel nets, gillnets, and longlines as fishing gear (Kavadas et al. 2013). The bottom trawler fishing fleet registered at the port of Patras and operating in the study area in 2014 consisted of 25 vessels. Experimental discard consumption by seabirds was conducted in May and December 2014 on-board a trawler (horsepower: 700 hp and length: 28 m) operating from the port of Kyllini (western Peloponnese). No samples were taken in the summer when, according to Greek legislation, it is prohibited for the fleet of bottom trawlers to operate, with the exception of a small number of Italian and Greek trawlers operating in the international waters of the area. Three observers, one ornithologist and two ichthyologists, were on-board the vessel and samples were taken during randomly selected hauling operations. Data collection was carried out between dawn and late afternoon so as to count the total number of seabirds assembling close to the trawler. Individuals of each species were identified using binoculars (10 × 50 magnification). Seabirds attending trawler fishing were counted during hauling operations conducted at a speed of 2–4 knots and with a mean duration of 30–45 min, until the end of the discarding process, following relevant standard methodological approaches (Abelló et al. 2003; Valeiras 2003; González-Zevallos and Yorio 2011). Information on seabirds associated with fishery operations included spatial distribution within a radius of 200 m (divided into three zones of 0–50, 50–100 and 100–200 m) around the fishing vessel, as well as behaviour such as kleptoparasitism, diving, resting, etc. Data on total catch and discards per haul, faunistic composition of discards listed as fish, cephalopods, and crustaceans, as well as weather conditions, date, time, location, duration, and depth of hauling operations were also collected. On-board experiments of discard exploitation by seabirds were performed during calm to fresh breeze conditions (< 6 Beaufort) so as to be able to check whether a discarded item was consumed or not. After preliminary screening, a representative proportion of discards per hauling operation was identified to species level using standard reference guides and then all discard items were measured and weighed on deck. The weight estimates provided an opportunity to extrapolate the discard rates per item to each hauling operation. Samples of different single discarded items were thrown overboard from the stern of the vessel, one at a time, in order to a) assess the scavenging behaviour of each seabird species, and b) quantify the extent of feeding (or non-feeding) specialisation in relation to the most abundant discarded species for which quantification of scavenging process by seabirds was possible. More specifically, each sample was randomly thrown at 5-min intervals to eliminate overestimation in discard utilisation (Garthe and Hüppop 1998). Single discarded samples contained a mean number of 10–15 individuals per discard item except for the rarest and/or largest, and consequently allowed quantification of the scavenging process by focusing on the proportions obtained by all bird species (and not by each species) so as to avoid relevant bias as indicated by Garthe and Hüppop (1998). We also included individuals of different sizes per experiment so as to use a more representative sample per discarded species and quantify their fate in a more reliable way (Garthe and Hüppop 1998). Consumption of the rarest and/or largest discard items, such as the dorso-ventrally flattened Raja species, was tested by throwing one individual over-board per experiment. All data (e.g., bird counts, depths, etc.) are presented as mean ± standard error. Kolmogorov–Smirnov and Levene’s tests were applied to the bird counts performed during different daily intervals and seasons in order to test distribution of data and homogeneity of variance, respectively. According to the values of Kolmogorov–Smirnov test (p > 0.05), we had no reason to suppose that the distribution of the bird counts for all species was significantly different from a normal distribution. One-way analysis of variance (ANOVA) or the Mann–Whitney U test were applied to determine differences in the mean number of seabirds attending bottom trawler operations between morning (05:00–12:00) and afternoon hours (13:00–19:30) as well as between seasons. More specifically, when Levene’s test showed that there was no homogeneity of variance (p < 0.05), the non-parametric Mann–Whitney U test was used. Pearson’s r correlation coefficient (two-tailed test) was used to measure the strength of the linear association between ‘at sea co-occurrence’ of different seabird species during hauling operations as well as between kleptoparasitic incidents and numbers of Yellow-legged Gulls attending hauling operations. Possible correlations were tested between the distance to the nearest coast and the abundance of seabirds but also between counts of seabirds attendance during hauling operations conducted within the same day. Minimum distances from the coastline were estimated using the ‘near’ proximity tool, which forms part of ESRI’s ArcGIS toolboxes (ESRI 2007). Statistical analysis was performed using the IBM SPSS statistics 20 software package and level of significance was set at p < 0.05. Mapping was implemented using ESRI’s integrated GIS system ArcGIS v 10.1. A total of 19 bottom trawler-hauling operations were monitored during the current study, conducted in 2014 (Table 1, Fig. 1). Some of the data appear to be generated around a same point of the Port of Kyllini, a fact potentially biasing our results. Fishery operations occurred at 107.6 ± 24.98 m depth with a range of 50–546 m. Total biomass of landings was 1718.0 kg (90.4 ± 6.73 kg per hauling operation), while the total respective biomass of discards was 1261.3 kg (66.4 ± 18.73 kg per hauling operation), representing 42% of the total fishery catch with discard rates ranging from 10 to 83%. In the study area, total bottom trawler discards as estimated using on-board observers and VMS data (Kavadas et al. 2013) were approximately 164.0 and 131.9 t in 2014 and 2016 respectively. Taking into account the average of annual biomass of discards estimations derived from data collected in the framework of Data Collection Framework (Council Regulation (EC) no 199/2008) and the consumption rate found here as it is described below, 106.1–117.9 t may be offered as a food subsidy to scavenging seabirds. A total of ten hauling operations were monitored where only two seabird species were found to attend all operations with their main purpose being to consume discards. Scopoli’s Shearwater (Calonectris diomedea) was the most abundant scavenger (2190 individuals, 64%), followed by the Yellow-legged Gull (Larus michahellis) (1210 individuals, 36%) (Table 2; Fig. 2). Moreover, the sampling operations revealed a distinct behaviour between the two scavenging species, with 80% of attending shearwaters being closer to the vessel (radius of 0–50 m) than gulls; 70 and 30% of the gulls were observed in a radius of 100–200 and 50–100 m, respectively. Although the shearwaters were on average more numerous than the gulls attending hauling operations, this difference was not significant according to ANOVA analysis (F = 3.49, df = 1.18, p = 0.078). No significant correlation was also revealed between the number of observed individuals per species attending each trawling operation (r = 0.054, n = 10, p = 0.883). Shearwaters were more abundant during late afternoon while gulls were present during early morning to mid-day (Fig. 3). Nevertheless, no significant differences in attendance at fishing operations were found for either Scopoli’s Shearwater (ANOVA: F = 2.79, df = 1.8, p = 0.133) or the Yellow-legged Gull (ANOVA: F = 0.001, df = 1.8, p = 0.97) during morning and afternoon hours. No significant correlation was also revealed between counts of seabird attendance during hauling operations conducted within the same day (r = − 0.187, n = 4, p = 0.813). In addition, no effect of the minimum distance from the coastline on seabirds abundance was detected, neither for shearwaters (r = 0.270, n = 10, p = 0.270) nor for gulls (r = − 0.227, n = 10, p = 0.529). The depth of samplings was 141.8 ± 45.70 m with a range of 70 to 546 m. Total biomass of landings was 897.3 kg (89.7 ± 10.90 kg per hauling operation) while the total respective biomass of discards was 799.2 kg (79.9 ± 34.41 kg per hauling operation), representing 47% of the total fishery catch with discard rates ranging from 10 to 83%. Forty-six species including 40 species of fish, four species of crustaceans, and two species of cephalopods were identified as discards (Table 3). Most of the catch discarded by bottom trawlers consisted of undersized commercial and non-commercial species. The five most abundant discard species caught were Annular Seabream (Diplodus annularis) (299.9 kg), Picarel (Spicara flexuosa) (85.9 kg), Bogue (Boops boops) (63.8 kg), Axillary Seabream (Pagellus acarne) (45.0 kg), and Large-scaled Gurnard (Lepidotrigla cavillone) (38.2 kg). Another aspect of the composition of trawler discard items was their classification into main categories according to their ecology. Benthopelagic species (35 species, 76%) were the most common, followed by benthic species (6 species, 13.0%) and pelagic species (5 species, 11%). In terms of biomass, benthopelagic species constituted the most important type of discarded items (692.2 kg, 87%), followed by pelagic species (66.9 kg, 8%) and benthic species (40.0 kg, 5%) (see Table 3). Feeding experiments (n = 109) using 24 different discard items revealed that both scavenging seabird species extensively exploited almost all types of discard by consuming 76 ± 2% of the total offered fishery discarded biomass (Table 3). Specifically, Scopoli’s Shearwater exploited 28 out of 46 discarded species (61%), while they seemed to avoid poisonous species and/or dorso-ventrally flattened as well as eel-like fish (Table 3). The Yellow-legged Gull showed a wider preference by exploiting 37 out of 46 discarded species (80%) and avoiding mainly large-sized (range of mean length: 112–491 mm) eel-like and dorso-ventrally flattened species (Table 3). 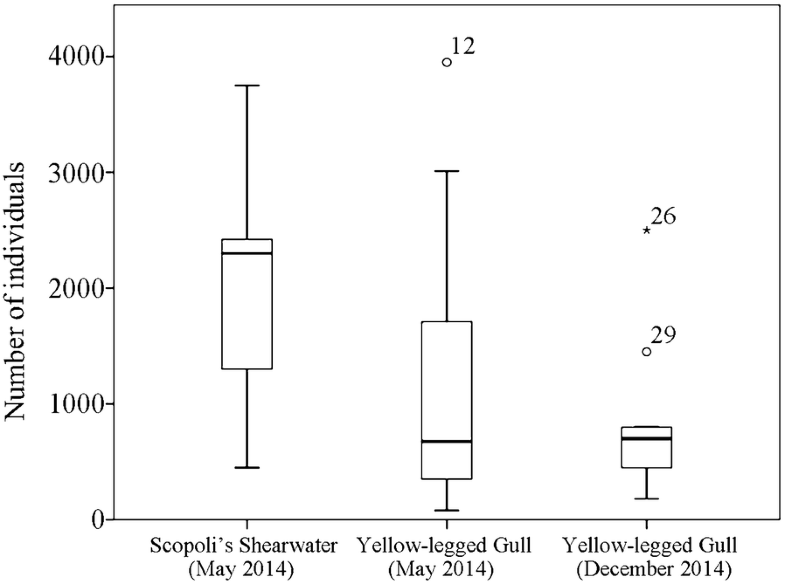 Adult Yellow-legged Gulls displayed kleptoparasitic behaviour on Scopoli’s Shearwater during feeding experiments by forcing shearwaters to release captured discard items, mainly medium-sized, and this behaviour was generally very effective. The number of such incidents ranged from two to four per experimental discarding event, and depended significantly on the number of gulls around the fishing vessel (r = 0.842, n = 10, p < 0.05), while more than 90% of them were successful. A total of nine hauling operations were monitored where only Yellow-legged Gulls attended as scavengers. Specifically, 768 gulls attended all hauling operations, while the mean number of observed individuals was 85 ± 23.86 (Table 2; Fig. 2). There were on average fewer gulls during winter compared to spring although attendance-level densities during hauling operations did not differ significantly between the two periods (ANOVA: F = 0.529, df = 1.17, p = 0.477). The majority of attending gulls (60%) were observed within a radius of 100–200 m around the vessel while only 30 and 10% were observed within a radius of 50–100 and 0–50 m, respectively. 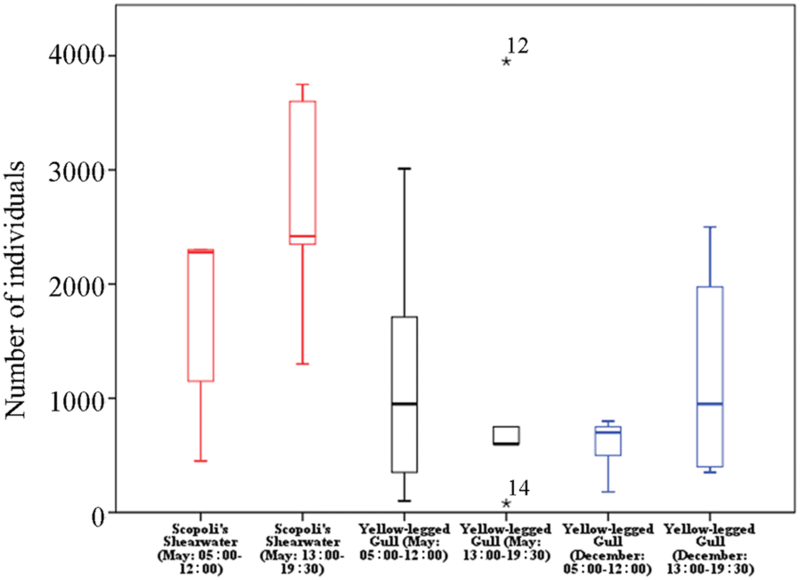 Contrary to spring observations, gulls were on average more abundant in the afternoon (13:00–19:00 h) than in early morning (05:00–12:00 h) but no significant differences in attendance during trawling operations were found during different daily intervals (Mann–Whitney U test: p = 0.624) (Fig. 3). No significant correlation was also revealed between counts of seabird attendance during hauling operations conducted within the same day (r = − 0.285, n = 4, p = 0.715). Additionally, no effect of the minimum distance from the coastline on gulls abundance was detected (r = − 0.238, n = 9, p = 0.538). Sampling was conducted at a depth of 69.5 ± 3.04 m and a range of 50–78 m. Total biomass of landings was 820.8 kg (91.2 ± 8.15 kg per hauling operation) while total respective biomass of discards was 462.1 kg (51.3 ± 11.55 kg per hauling operation), representing 36% of the total fishery catch with discard rates ranging from 12 to 58%. Thirty-seven species including 29 species of fish, four species of cephalopods, and four species of crustaceans were identified as discards (Table 4). As for the spring sampling, the catch discarded consisted of undersized commercial and non-commercial species (Table 4). The five most abundant discard species caught were: Atlantic Horse Mackerel (Trachurus trachurus) (234.9 kg), Boops boops (87.3 kg), Spicara flexuosa (19.5 kg), Deepwater Rose Shrimp (Parapenaeus longirostris) (16.5 kg) and European Conger (Conger conger) (13.1 kg) (Table 4). The composition of trawler discard items showed that benthopelagic species (26 species, 70%) were the most common, followed by benthic species (six species, 16%) and pelagic species (five species, 14%). The largest proportion of discarded biomass belonged to pelagic species (245.0 kg, 53%), followed by benthopelagic species (178.1 kg, 39%) and benthic species (39.0 kg, 8%) (see data in Table 4). Feeding experiments (n = 33) using five different discard items revealed that Yellow-legged Gulls extensively exploited almost all types of discard by consuming 71 ± 4% of the total offered fishery discarded biomass (Table 4). Gulls exploited the majority of discard items (30 species, 81%), while mainly large-sized eel-like and dorso-ventrally flattened species were avoided (Table 4). According to this study, the total biomass of discards was found to represent 42% of the total fishery catch, which is close to 45% of the catches reported discarded in the north-eastern Mediterranean Sea (Machias et al. 2001) and can be characterised as high compared to relevant weighted average discard rates for the main types of fisheries worldwide (Kelleher 2005; Bellido et al. 2011). On-board observation data revealed differences in discard composition and patterns between the two sampling months as described by Bellido et al. (2011). The number of observed discarded species (46) and the total biomass of discards (800 kg) were found to be higher in spring than in winter sampling operations (46 vs 37 species and 800 vs 460 kg respectively). An obvious explanation is the breeding season of fish, given that reproduction of Mediterranean ichthyofauna takes place mainly from spring to midsummer (Tsikliras et al. 2010). However, the significant difference in the quantity of discards between the two periods can be attributed mainly to the catch of two species, namely the Annular Seabream and Atlantic Horse Mackerel. The biomass of Annular Seabream alone (300 kg) caught during the spring season is sufficient to explain the difference. The catch of so many juveniles of Annular Seabream is due to the fact that breeding takes place from April to August, with a peak during the first half of May (Matic-Skoko et al. 2007), forcing local fishermen to systematically avoid fishing areas with a high abundance of that species. This is evidenced by on-board data; total biomass of Annular Seabream is attributed primarily to a single haul performed on 5 May 2014. In contrast, Atlantic Horse Mackerel appeared systematically in almost every haul in winter, because the breeding season of this species coincides with this sampling period (Alegria-Hernandez 1984, 1994; Jardas et al. 2004). Consequently, the total discarded biomass (235 kg) of this species was 600% higher compared to the respective biomass of the spring sampling period. Regarding the large seasonal variations of other abundant discarded items such as Picarel, Axillary Seabream, and Large-scaled Gurnard, these are due to the fact that their breeding seasons coincide with spring. On the other hand, the abundance of species such as Bogue, European Conger, and Deepwater Rose Shrimp was consistently high during both sampling seasons. Bogue is a common catch throughout the year with a large proportion of discards. European Conger is not a commercial species and, therefore, every captured individual, at any stage of maturity, is rejected as discard. Additionally, the abundance of Deepwater Rose Shrimp, at least locally, is relatively high throughout the year, while that species seems to breed twice a year, in January and August. The most abundant seabirds in the Ionian Sea are Scopoli’s Shearwater, Yellow-legged Gull, Yelkouan Shearwater (Puffinus yelkouan), and the Mediterranean Shag (Phalacrocorax aristotelis desmarestii), and they are all known to scavenge regularly or infrequently (Bicknell et al. 2013). The Northern Gannet (Morus bassanus) and the Great Skua (Catharacta skua) as well as the Mediterranean Gull (Larus melanocephalus), during autumn and winter, are also rare scavengers in the Ionian Sea (pers. obs.). Yet here, it was observed that only Scopoli’s Shearwater and the Yellow-legged Gull follow fishing vessels and extensively consume fishery discards. Scopoli’s Shearwater is a long-lived migratory pelagic Procellariiform species, exploiting persistently productive marine areas. It is a surface feeder, consuming mainly pelagic fish, whereas the importance of benthic fish is minimal, at least during incubation and the chick-rearing period (Afán et al. 2014). Recent findings have shown that this seabird adopts a dual foraging strategy, feeding on epipelagic shelf prey in shallow waters during short trips and on oceanic prey items, normally associated with different water masses, during long trips (Cecere et al. 2013). Foraging behaviour is also influenced by a number of environmental variables such as the moonlight phase as well as by the different stages of the breeding period (Cecere et al. 2013; Rubolini et al. 2015). This top marine predator is attracted to fishing vessels providing food via fishery discards and is accustomed to forage near the sea surface (Cecere et al. 2015). Moreover, during on-board observations for the evaluation of by-catch seabird mortality in the study area, Scopoli’s Shearwater was found to be the most abundant species attending fishing vessels, followed by the Yellow-legged Gull (Karris 2014). Shearwaters feed on a range of different fish but also on specific cephalopods such as European Squids (Alonso et al. 2012; Neves et al. 2012). According to our results, bottom trawler fishery operations in the study area provide significant amounts of benthopelagic prey species to shearwaters during their pre-laying period in spring (Karris 2014). This alternative food supply can be characterised as normally unavailable due to the foraging ecology of Scopoli’s Shearwater and, as a consequence, may affect the population dynamics of local colonies and specifically of the Strofades population. The fact that this pelagic seabird is a generalist piscivore was also observed in the Ionian Sea where it displays scavenging behaviour. Such wide-ranging feeding habits may enable this species switch to alternative food resources in the event of a ban on discarding. Conversely, this could lead to a more energy-demanding foraging strategy by undertaking long trips so as to feed on oceanic prey items. Additionally, trawling inactivity during specific breeding stages such as pre-breeding and chick-rearing periods may increase the by-catch rates of shearwaters in longline fisheries in their effort to steal bait from hooks (Laneri et al. 2010). Scopoli’s Shearwater was not observed attending trawler operations during early December, which can be explained by the following migration pattern: according to geolocation data retrieved from the Strofades colony, shearwaters begin to migrate to the wintering coastal areas of western Africa in late October (Karris 2014). On the other hand, Yellow-legged Gull showed a wider use of discard items in both seasons and not only during the spring sampling period, which coincides with the chick-rearing period and recognised as a crucial phase of its life cycle (Alonso et al. 2015; Telailia et al. 2015). Previous diet analysis studies (Ramos et al. 2009; Arizaga et al. 2010; Talmat-Chaouchi et al. 2014) suggest that Yellow-legged Gull is a generalist carnivore at population level, feeding extensively on discards; this was also revealed by this study. Its high rates of ecological and demographic success pose real problems of interaction with humans (i.e., food competition, economic damages, disturbance) with negative impacts on the ecosystem (interspecific competition for breeding sites and food, direct predation, changes in vegetation cover) (Bicknell et al. 2013). The expansion of this opportunistic species in the Mediterranean shows that this phenomenon is partly due to food provision via fishery discards and the relevant scavenging capacity of Yellow-legged Gull (Bosch et al. 1994; Ramos et al. 2009). The lack of adequate data on the diet of the Ionian population of Yellow-legged Gull and predation on other sympatric seabird species, as well as the even less-known impact of the local fishery on the oligotrophic Ionian ecosystem, should be taken into account when evaluating the impact of a discards ban on the conservation of seabird populations. For example, body mass, egg volume, and clutch size of the Yellow-legged Gull in the Balearic Archipelago of Spain declined significantly after an experimental decrease of another food source of anthropogenic origin, namely an open-air landfill site (Steigerwald et al. 2015). In this context, the potential response of the scavenger population must be taken into account. According to the data recorded by on-board observers, exploitation rates of trawler discards by the two common scavenging seabirds in the Ionian Sea are high, namely, 93% of total discarded biomass. The mean percentage of all experimentally discarded items consumed by seabirds was 75 ± 4%, which is comparable to the outcome of a relevant study conducted in the Baltic Sea (Garthe and Scherp 2003). We assume that this proportion of discard utilisation based on single item experiments is not an underestimate as Garthe and Hüppop (1998) suggested for the North Sea, since the spatial context of the current study was focused on a known hotspot for seabirds in the Ionian Sea, and the relevant time context was also restricted, since we calculated averages over each single sampling season. Considering that the populations of Scopoli’s Shearwater and Yellow-legged Gull in the Ionian Sea are estimated at approximately 17,240–18,400 individuals and 2368–2598 individuals respectively (Fric et al. 2012; Karris et al. 2017), it appears that discards may support a substantial part of both populations. We can assume that the use of the roughly estimated annual fishery waste in this study can contribute to maintaining the current population numbers of the local scavenging seabirds, especially for a generalist piscivore like Scopoli’s Shearwater and to a lesser extent for an opportunistic species like Yellow-legged Gull. Additionally, the importance and suitability of the discards used as prey by seabirds in general must be further investigated since Grémillet et al. (2008) argue that these are of lower energetic quality than their natural prey, and thus have a deleterious effect on the reproductive success of scavenging seabirds. The baseline information obtained by the current study confirms that Scopoli’s Shearwater and Yellow-legged Gull constitute the main scavenging seabirds in the eastern Ionian Sea. Both scavengers extensively exploited trawl fishery discards and consumed 70–80% of the total discards biomass. They also appeared to avoid poisonous species and/or large-sized fish. All authors made substantial contributions to conception and design, analysis and interpretation of collected data. More specifically, GK, VR-K, and AK participated in sampling and data collection operations. GK, SX, AM, SK, IM, and VR-K contributed to data analysis for seabirds and discards and have been involved in drafting the manuscript. All authors read and approved the final manuscript. We are very grateful to the skipper and crew of Panagia Faneromeni II for their fruitful collaboration during on-board experiments. We also thank Athina Kokkali for preparation of the map. All datasets collected and analysed during the current study are available from the corresponding author on reasonable request. All experiments were performed by following international and national regulations for the care and use of wild animals. The current research does not include studies involving human participants, human data, or human tissue. The study performed within the framework of the ECODISC project, entitled “ECOsystem effect of fisheries DISCards”, partially funded by the NSRF 2007-2013 Operational Programme “Education and Lifelong Learning”, which is co-financed by Greece and the European Union. Fisheries data were collected within the framework of the 2014 Greek National Fisheries Data Collection Programme (EPSAD) funded by the Greek Government and the European Union under Regulation 199/2008/EU.